Amgad Morgan is mobilizing blood donors, connecting them to people needing blood, & systematically identifying & treating individuals with blood diseases. Amgad and his organization, Nabd El Hayat (“pulse of life”), use rigorous, comprehensive campaigns that tap into volunteers, government, business, and the health sector to shift mindsets around blood donations and diseases. “Hope,” Amgad’s mobile application, connects patients in need of blood to suitable donors. His network of citizen sector organizations (CSOs) establishes trust with infected citizens, overcoming the associated stigma with blood diseases and creating focal points for health education in communities. To reach the rural poor, Amgad encourages CSOs and companies to not only sponsor campaigns, but also to finance treatment for citizens who could otherwise not afford it. In Egypt, blood diseases are a serious public health, economic, and social challenge. Often, the people who most need blood are unable to access or afford it. Amgad’s strategy is distinctive because he addresses the three most important pillars required to solve the problem: increasing the national blood supply; fighting stigma and building awareness of the importance of testing and identification of blood diseases; and ensuring adequate treatment for these diseases. Amgad’s interventions result in a healthier population. In 2017, 750,000 people with blood diseases were connected to treatment through his online platform and campaigns; Amgad expects 1.5 million people will be treated in 2018. Through his nationwide campaigns, he successfully increased blood donations by 40,000 bags. His “Hope” app has spread and is now used in 35 countries and available in eight different languages. Amgad is currently working on a new version of “Hope” that will be available to the whole world, making it the first global blood donation platform that anyone can use. 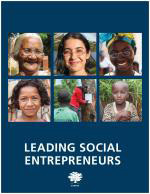 Amgad' s story appears in the 2018 edition of "Leading Social Entrepreneurs" which features a selection of just a few of the Ashoka Fellows recently brought into the largest global network of social entrepreneurs. The LSE presents some of the newest innovations by leading social entrepreneurs whose ideas are changing the way things are done all over the world.